Hi guys the BC51 tracklist has officially hit the net so here ya go! Prepare to have some fun with track 5 it’s a little bit crazy! T6 is great too – and love track 3 so much! As always when LM covers have been used I’ve tried to link to the original (actual remix of Kung Fu Fighting used in BC51 is MUCH faster than one linked). For more info on this release see my BODYCOMBAT 51 filming post. Enjoy! This is the BIG ONE! 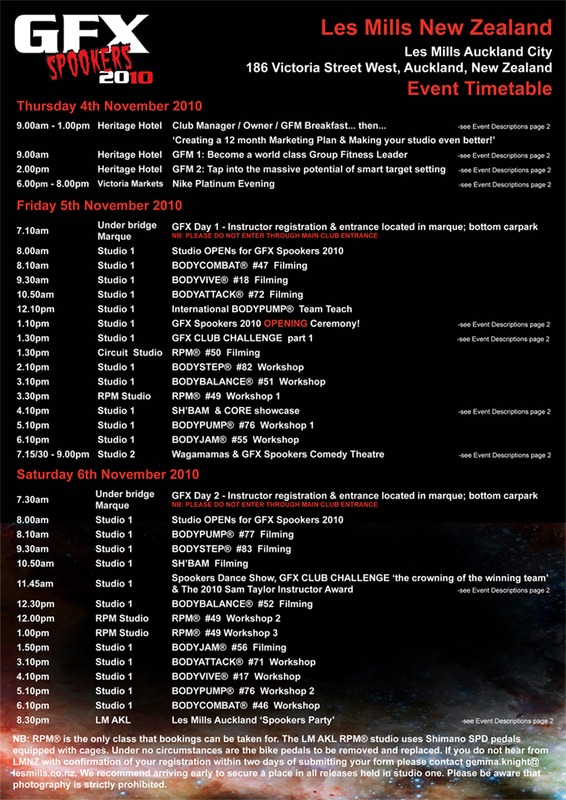 November 2010 sees the GFX – if you don’t know what the GFX is it’s a Group Fitness Xtravaganza where all the DVD filming classes, workshops and special training sessions are combined into one huge weekend which finishes in a MASSIVE party! The last one (in May last year) was absolutely crazy and this one is looking to be even bigger! 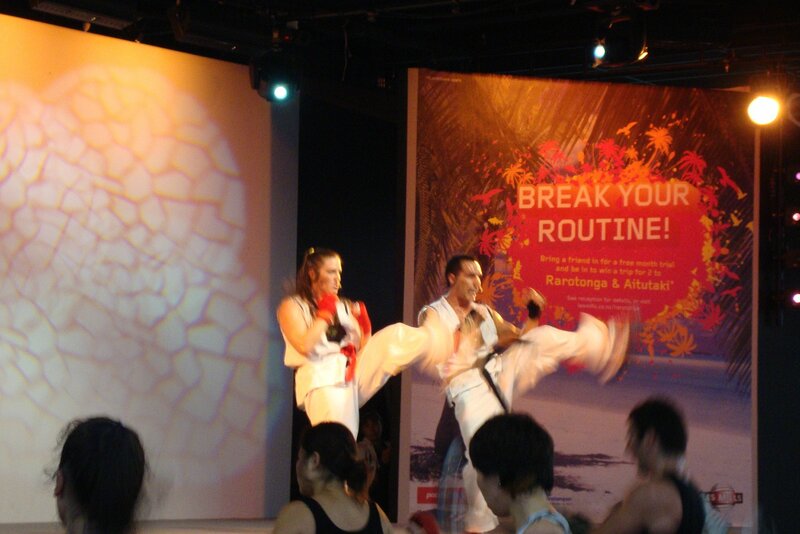 If you were to come to one event at Les Mills NZ – THIS would be it. 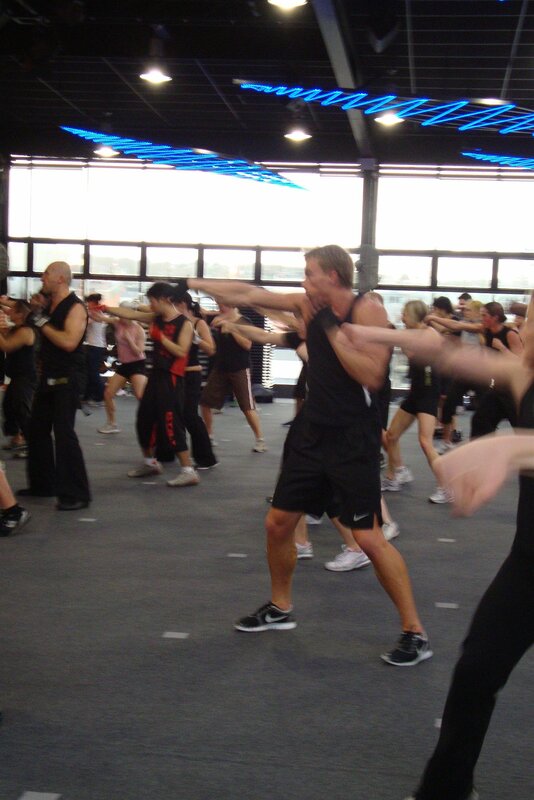 You’ll need to contact Les Mills NZ to book in. If you are thinking of coming do let me know – and remember to make sure you turn up super early for each event. The queues last year were literally down the street an hour before the opening, and if you do come all the way to NZ to be there I’d hate for you to miss out! It’s officially less than two months away now so the countdown is on! I’ll see you there! Update 24 hours after posting the below: Hmmm….I actually started writing this post on Saturday night, and completed it on Sunday. At the time I started it I was exhausted; I’d literally done about 6 hours of exercise that day, had driven for 2.5 hours, and had eaten the grand total of 2 muesli bars the entire day (I’m not exaggerating – literally that’s all I had time to eat). So yes, in hindsight I was very grumpy. I almost didn’t post this as a result, and actually, reading back over it perhaps I should’ve just trusted my instincts and held off. If you do read the below perhaps bear in mind my level of exhaustion when writing. Looking back over the day – the generic was fun, albeit exhausting and perhaps a tad OTT (over the top). I’ve had a couple messages from people who agree, and others who think I’ve painted the day a tad harshly. I think the latter is fair… and I apologise to anyone at Les Mills who I may have offended. (I love you guys honest!) Anyway, again, perhaps my tone is a bit on the rough side and if you could read the below taking into account I was a tired, starving, low blood sugared over-trained freak when I wrote it I’d appreciate it! 🙂 By the way, if you’ve yet to do your workshop DEFINITELY go! But just be prepared to work hard – and take some food! (something I should’ve done!) Okay – read on with caution…. This weekend just gone was the quarterly instructor workshop in Auckland, always a fantastic day, a chance to experience all the new releases, network with other instructors, and see the master trainers in action and pick up a few tips. 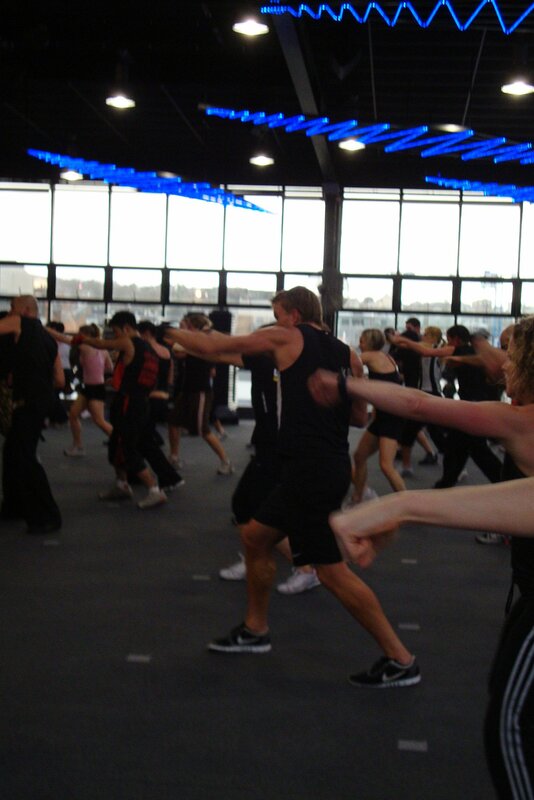 It was always going to be a big day for me – I had to take my BODYCOMBAT class here locally which finished at 9:30am – then leap in my car and come screaming up in time to make the BODYATTACK class in Auckland at 12:10pm (for those that don’t know I live about 2.5 hours drive south of Auckland which didn’t leave me much margin for error!). 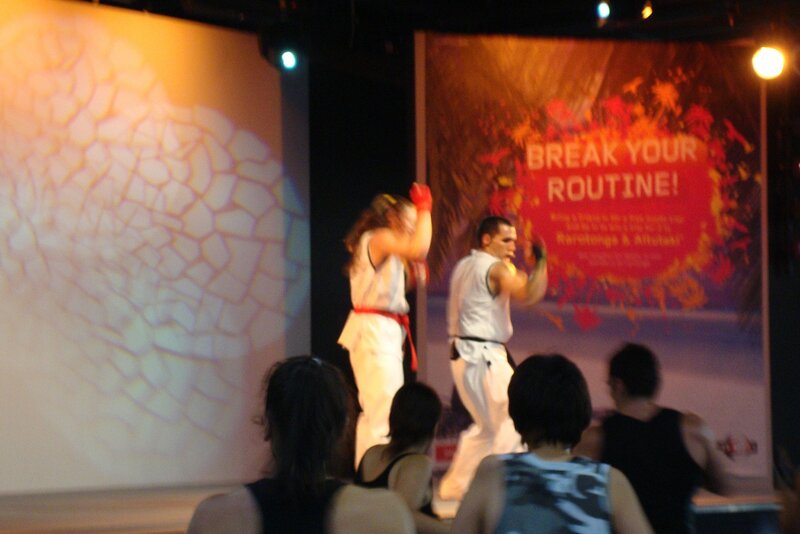 Following BODYATTACK was BODYBALANCE, BODYCOMBAT and finishing up with BODYPUMP at 5:10pm. So 5 classes all up – and in the middle of all that (and the reason for this blog post), was the Instructor Generic Workshop. Now, I’m not a negative kinda guy. I like to think of myself as a glass is half full kinda person… I can’t recall the last time I even wrote something negative in this blog. Even if there’s a track I don’t like, or heaven forbid an entire release I don’t like I always try to look at it from all angles and write about the positives. Choreography, Music, it’s all subjective – just because I don’t like it doesn’t mean many won’t love it… etc etc. I always try to put a positive spin on everything as I’m but a minor cog in a much larger wheel. However no matter which way I look at it I can’t do it this time; frankly, the generic this weekend PISSED ME OFF. We all grouped in the main studio as always and were proceeded to be yelled and screamed at for 60 minutes by an army bootcamp instructor. After running around the studio countless times and dozens of drills (burpees, pressups, star jumps, more burpees, more pressups, more pressups…) we were spilt into 8 groups – each one meant to represent a different LM programme. We then moved around each group doing a series of drills (apparently) related to that specific programme. I say “apparently” as it was really just an opportunity for the different group leaders to smash us one after the other. In the “attack” group we did dozens of shuttle runs, burpees, pressups, more shuttle runs, drills of dropping completely to the floor then sprinting to the other end of the gym, dropping again and running back; combat was more pressups, more burpees, more pressups; over and over again. The vive session was spent walking back and forth from side to side the entire time with the bands around our legs. Jam was running from one side of the room spinning around and around and crawling on the floor. You get the idea. And this is my point – I mean – I’ve never done a burpee in combat – what was the relevance of all this? Finally at the end when I was asking myself that very question again (WHY??!) Mid came out (don’t get me wrong – I adore Mid) and told us that it was a chance to experience each programme and learn something new from it. I LOVE YOU Mid but pullllease. I learnt how to be yelled and how to do 7000 pressups. No one I spoke to learnt a thing – everyone was left standing at the end questioning why, when we all have numerous classes to attend, and why, when we’re meant to be experiencing and learning each release did we spend an hour being smashed in bootcamp style. I already had 5 hours of classes to do – five hours of exercise already to do – I left that session absolutely exhausted and if anything wasn’t able to fully appreciate each of remaining releases that day. It’s no secret that many instructors don’t turn up to workshops. Many can’t be bothered. In the last 18 months I’ve not missed one. But I really have to question how worthwhile this workshop was. I watched instructors drop like flies later that day. Balance (which was straight after the generic) started packed and by half way was a third empty. Combat which came after that was the same. I was towards the back of the class in both and could move up to half way no problem mid way through. Les Mills, guys, I’ve always got your back but you missed the mark here. Smashing your instructors on a day they are meant to be taking the releases in, and learning from them, on a day when most of us have many classes to do with no time in between to refuel or rest… not cool. It’s Monday night as I type this and my body has barely recovered from the quarterly workshop in Auckland on Saturday… t’was huuuge!! My day kicked off with BODYPUMP 71, followed by BODYBALANCE 46, BODYCOMBAT 41 and finally got absolutely smashed by BODYATTACK 66. The plan was to do pump, then grab a bite and head back to LM for the other three classes; stupidly we didn’t take a change of clothes and after combat had no choice but to whip back to the hotel and get changed (again!) for attack. My clothes were so drenched by the end of that class I looked like a cartoon character! Must’ve burnt some serious calories! The BODYPUMP presentation team included the big guy himself; Glen, Susan, Matty T, George and Amy Styles. They did an awesome job (well no surprises there! 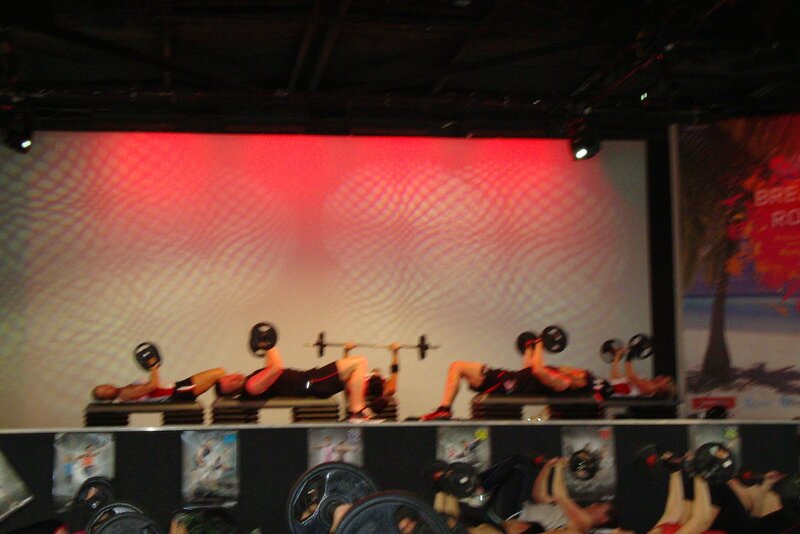 ); Amy completely destroyed our legs with that lunge track (my quads are actually flinching as I even think about it!). The combat crew was Hernan, Ang and Kendra – oddly they were dressed in a martial arts gi presenting a release with the theme “Backyard Brawl” (yeah confused me too??!) They had fantastic chemistry though and the class was hugely entertaining. Finally the day ended with attack presented by Amy, George and Grant. Although I’m very new to attack and have little experience as a reference this class had my head spinning (in a good way!). The music, the energy and the electric atmosphere were just off the planet and I can’t wait to do it again. 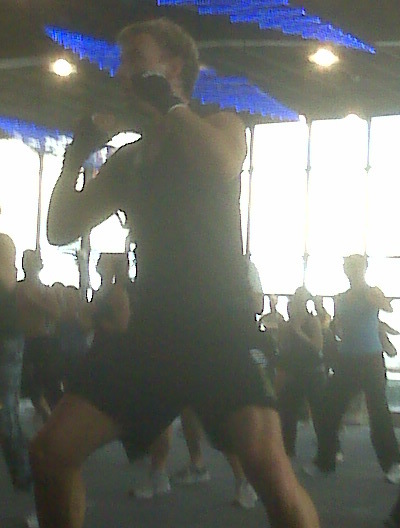 Saturday was the first time I’d even seen BODY COMBAT 38 (apart from the track listing). Did feel kinda strange as I’d already done BC39 (due to the fact I went to the filming) but nevermind! Anyway, in short – I loved it. LOVED IT! It is hard to get a decent feel for a release when you’ve only done it once, but honestly, after having done BC39 once as well I enjoyed 38 A LOT more. It rocked! I loved the warm up mainly because I really like both the tracks that make it up. If you don’t like dance music obviously you won’t feel the same. Both tracks are light and really uplifting! The upper body is “Writing on the wall” by 2-4 Grooves whilst the lower body warm up is “Because the Night” by Cascada. Really enjoyed this. Combat 1 seemed to me to be a typical track 2 – it was “Try It Again” by The Hives. Both track 2 and the power training track (“Like I feel (squad-e mix)” by D:code Feat Emma) aren’t really standing out in my memory which leads me to believe they are exactly what you’d expect from combat 1 and power training 1. Combat 2 (track 4) is a TOTAL KILLER. If you thought “We will survive” was hard in BC37 with it’s 260 odd kicks then you’re in for a rude awakening. Dan claimed there are 300+ in this track! (Addition: As it happens there’s no where near 300 kicks in this track – more like 240; So around the same as We Will Survive – maybe Dan was just trying to freak us out haha – however make no mistake it FEELS like there’s over 300 that’s for sure!) It’s in two parts. The first part is “Headbangerz Rock Da Club” by Nick Skitz and that is a kick combo not completely different to the kick combo in BC37. Lots of back kicks, knees and front kicks. The second part (“Cold As Ice” by Starsplash) really finishes you off with loads of roundhouse knees into sidekicks (think The United Vibe from BC35). Absolutely leg shattering track and a real highlght for me. I’m not sure what the track length is but it is loooooooong! I think people will either love or hate it. Track 5 (“The Best Damn Thing” by Avril Lavigne) was MUCH better than I thought it would be. MUCH! I’m not an Avril fan and I expected something similar to the last Avril track 5 – “Girlfriend” from BC33. Thankfully it’s not. It’s not a split room track either which is all good. I was surprised at how much I enjoyed this. Prepare to have your legs cained in track 6 (“No Good” by The Prodigy). The esquiva is back and it’s a killer. The one thing that really stood out for me in this track is the cool esquiva into front kick combo. This tracks hurts no two ways about it. I know I enjoyed the muay thai but I honestly can’t remember that much about it! The song is “Raver’s Paradise (Stadium Mix)” by Nick Skitz feat MC BB. I can recall a lot of street brawler downward punches and lots of knees… I’ll write a lot more about this in full when I get the DVD. Highlight for me without question: Track 8: “What hurts the most (Al Storm remix)” by Cascada. THIS TRACK WENT OFF! It goes on and on and on and the levels just keep building! You think you’ve hit level 4 and then bang – the music builds again and you reach even deeper and power on! Then just when you think it’s over – WHAM – another level hits you and you’re off again! I swear the endorphins your body produces in this track will keep you buzzing for hours afterwards. Absolutely awesome! The whole room was cheering as the track progressed. It was incredible and I can’t wait to release it. Conditioning – was hard. The track was “When I grow up” by Pussycat Dolls. Personally I hate the song with a passion so wasn’t expecting to enjoy it. Dan challenged us to do it all on our toes. In fact he said he’d buy a beer to anyone that could – and it was probably a pretty safe bet for him… the track has 64 press ups with no breaks! 32 chest and 32 tricep. However, Dan you do owe me one as I did manage it (just!). The ab portion also has the plank which is a killer move as we all know. Cooldown: “Say (All I Need)” by OneRepublic. Beautiful. Not too much kata which I prefer. Excellent end to a fantastic release. As I said expect a much more complete review in a few days… but this release is DEFINITELY one to look forward to… yay! Pics follow – apologies for quality they were taken from my cellphone. 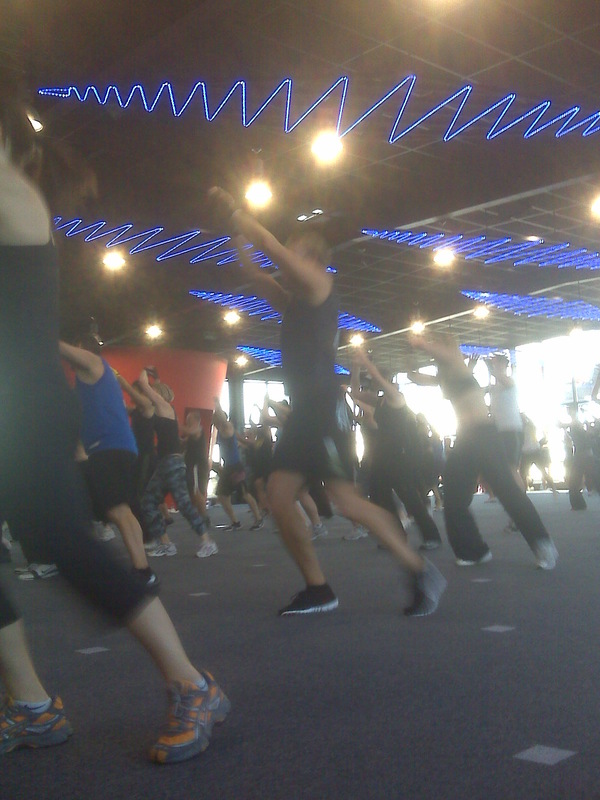 So spent this Saturday just gone at the Les Mills Quarterly Workshop in Auckland… was an awesome day all up. For those that don’t know, this is where all the Les Mills group fitness instructors go to view the latest programme releases first hand, as well as some generic training sessions that usually entail subjects that cover all the different disciplines. Apart from the fact that it’s a requirement instructors attend 3 out of 4 of these per year, it is a really great way to meet and network with other likeminded people – and get a feel for the focus of each release right from the horse’s mouth. This quarterly was even more important if you were a combat instructor as the first part of the day was the “BODYCOMBAT Intensive” with one of the actual programme directors (Dan Cohen). So that’s where my day began and I have but one single word to describe the experience: PAIN! It started well, Dan sat us all down and we spoke about BODYCOMBAT, it’s essence, the fact that incorporated many different martial arts and we should really work on the authenticity aspect. 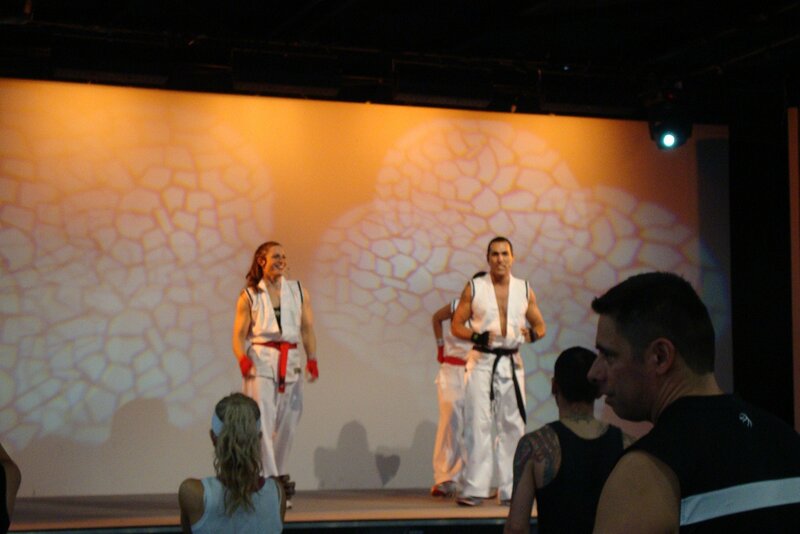 That is; try to get some real experience working with each of the individual martial arts that make up BC. One of those ways is to do “circuit style” training, whereby you move from station to station doing a specific drill that is a component of one of those styles. All makes sense right – and seems easy enough? WRONG. Bag work: 3 minutes of a specific combination on a kick bag; The combo was: L jab, R cross, L hook, R round house (off the back leg), L jab, R cross, L switch roundhouse (like a switch knee but where you scissor then kick off the back leg). This killer exercise where you go into a plank position but your toes are on a mat, then you have to drag the mat across the full length of the gym and back using only your hands for 3 minutes. It’s like a plank on steroids and a TOTAL killer. This is the main reason I’m in so much pain today. It is MUCH harder than it sounds – many people could hardly move the mat at all! I swear by the end of the third minute doing this I was ready to die. Traditional karate punches:Whereby you step forward with one leg and punch with the alternate arm in a formal karate style stance. This was the easiest drill but after the mat work above most of the 3 minutes was spent recovering! “Punching” a 15kg weight up 45 degrees for 90 seconds each arm. This really stattered the shoulders! 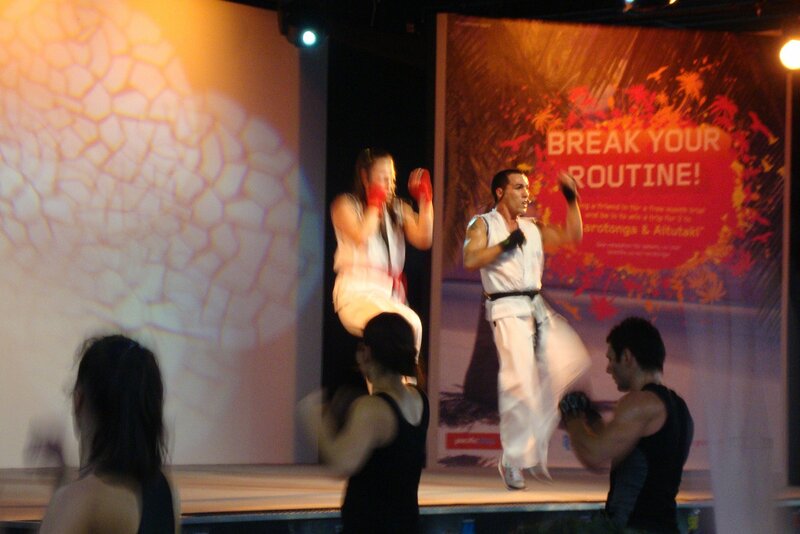 Capoeira aú: An aú in capoeira is kind of cartwheel movement but at all times you keep your eyes on your opponent. Was fun to learn – thankfully we were told this won’t be incorporated into BC… can you imagine a packed group fitness room cartwheeling from one side to the other. Chaos! Rope climb. This way as killer as well, climbing a rope to the top of the gym (probably 5 or 6 metres) then climbing back down non stop for 3 minutes. This wouldn’t have been so bad if we hadn’t done it towards the end of the session. By now our bodies were destroyed! The plank mat dragging, the robe climbing were the real killers. My hands and stomach were both burning afterwards! One thing I did take away from this session (apart from the pain!) was what I think is a fair idea of what we can expect in future releases (possibly from BC40 or 41). I’ll go into these in another post. 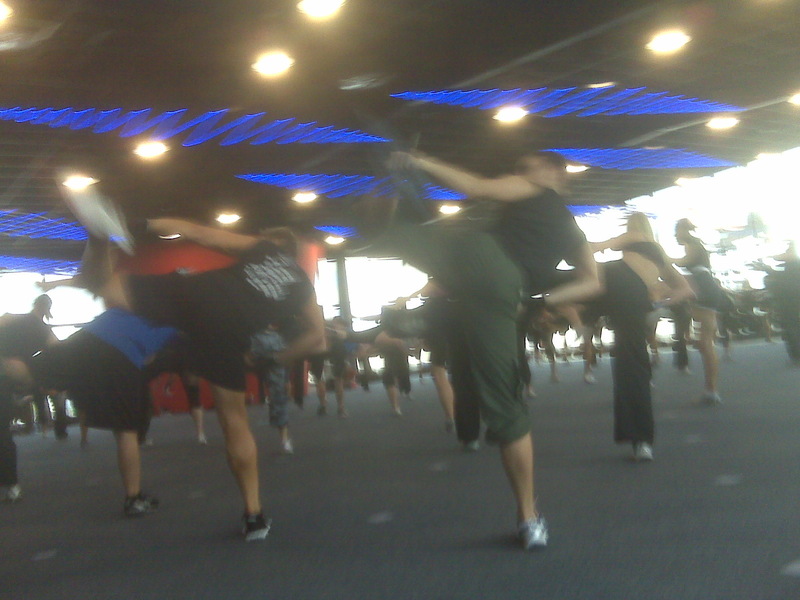 We ran from this session straight to the BODYCOMBAT 38 release so I’ll write about that next!